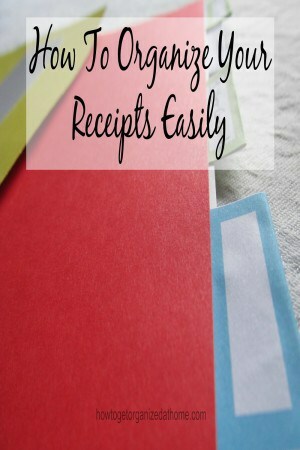 Having a way to store your receipts, the ones you need to keep is important; you want to easily grab a receipt if you need to return an item or if you need to keep track of them for your business. The problem is, how to store them. They are often on small pieces of paper, making them hard to find and to find the right system, which works is difficult, too. The system that you choose must suit you and be manageable and workable for you and your family. Knowing what doesn’t work is a great step in the right direction, So how do you organize your receipts? I have had a problem with receipts for years, they drive me mad but I have in the past kept every single receipt and stored these in individual poly pockets with the month and year carefully written on the outside, and the truth is I still have boxes of these that I need to sort through. I know it is a long process and something that I will do in short bursts; my problem was I didn’t know what else to do with them, how else do you store receipts? I researched this topic extensively because I wanted to find a system that would work. I have tried folders but I dislike ring binders, I don’t have a shelf near my desk, yet I do have a filing cabinet that I can use. I find that paper starts falling out of ring binders and I didn’t know how to slip in receipts in a system that would work. I can’t afford to go paperless with products like these either yet! However, I needed to get them sorted and I am not keeping receipts that I don’t need any more, they go into the paper box to make fire blocks with. I am also not storing old receipts in my filing cabinet, after the year they can go into my archive storage system. Therefore, I needed a system that would work, that was easy and could fit into my daily working with ease, but also didn’t cost me any money. I’ve been looking for answers to my problem when it suddenly hit me I was approaching it all wrong. There was no way I was going to find a receipt using my old method, so what if I changed how I was storing them, if I use categories instead of months then there is hope of finding the receipt in the future. However, it didn’t answer the problem of how to store them, what system I would use until inspiration hit. I have some old cardboard files but they are too big to fit into the filling cabinet, and the edges, worn, but in theory, there was nothing wrong with them. I removed the pocket and trimmed it down to the right size and it is perfect to hold the receipts in their different categories. Then last week I had the answer to something I’ve been looking for. Alli from scatteredsquirrel.com had created just what I was looking for, tab tops that you can print and cut out, they look fabulous too. I printed and cut these out and just stuck them onto some coloured card stock I already had and they are perfect, I am still working on the categories that I need. Therefore, I had a system on how to organize receipts in my home that I knew just wasn’t working and I could have spent a fortune on a new system without knowing if it would work for my family; however, with some research and some thought I have a new system that didn’t cost me anything at all, except maybe some time. 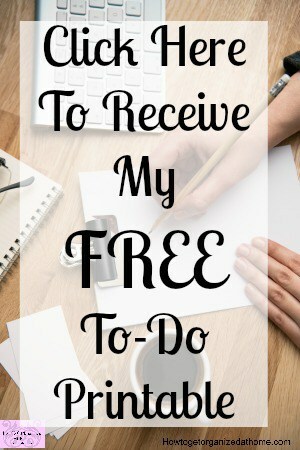 I can try this new system to see if this works and if it solves my receipt crisis that I have if it doesn’t then it is back to the drawing board; but for now, I like the way this system fits my needs, I have found a way to organize your receipts too. If you are looking for more articles on this topic head over to the landing page where you will find links to other posts on paperwork. 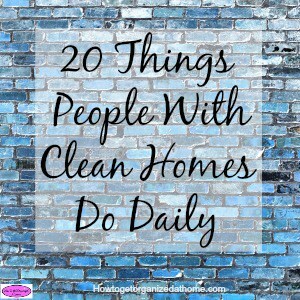 I wrote an article that I think you will enjoy, 20 Things People With Clean Homes Do Daily! Oops, you’re supposed to keep receipts? I am totally on top of my paper filing system, but my receipts are in plastic/paper bags by year. I have 7 different bags, and some of the receipts are blank at this point. Great organization idea, thanks for sharing! Found you through Frugal Fridays! I love tips on organizing! I’m a bit of an organizational junkie myself. Great tips! Thanks so much for sharing with us at #HomeMattersParty. Hope you join us again next week! The door opens Friday EST.